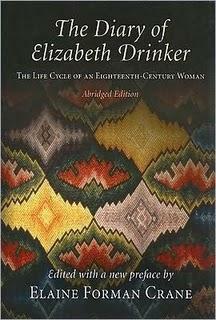 The preface to this newly issued, abridged version of Elizabeth Drinker's diary, published originally in three volumes in 1991, reveals the sort of personal relationship the editor has formed with her subject over the past decades, an intimacy that forms often in historical scholarship, especially in single-author studies and even more so when the genre of focus is so inherently intimate, as the diary form certainly is. In this case, the diary is a record of fifty years in the life of an eighteenth-century Quaker Philadelphian. The abridgement focuses on four phases of Drinker’s life: her youth and courtship (1758-61), which coincides with the Seven Years’ War (often referred to as the French and Indian War); her experience as a young wife and mother in the years leading up to the Revolution; her years of “crisis,” as Crane describes them, from 1776-93; and her final years as “Grandmother and Grand Mother” leading to her death in 1807. Unlike narrative history or biography, the diary offers the reader a limited and often cryptic view of this woman’s experience. Few of the entries are longer than a typical Facebook update, and in many respects, they are of a similar quality: a quick memorandum selecting the day’s highlight (or, just as often, lowlight). Yet there is an enormous amount to be gleaned from the diary about the gender roles that dictated much of a woman’s experience, as defined also by class and profession of faith. Seen as a kind of pointillism rather than as a realist painting, the work provides extraordinary access to life in the Philadelphia area, especially during the Revolution: to the experience of being Quaker during a time of war and social upheaval, of being a slave-owner who all too belatedly experiences a crisis of conscience (after she had already irretrievably sold the person whom she “possessed” via inheritance), to the grim facts of life and mortality in eighteenth-century motherhood, and to the tedium and suffering that provided the texture of most of her days. The fact that this is the third form in which the diary has been published (a longer condensed version was published in 1994) provides evidence of its usefulness to historians, citing the diary in a wide variety of contexts. For example, it is an essential tool for those working on the history of American religion. The phrase “went to meeting” is probably the most often repeated in the diary, and readers get a sense of how prominent a role her participation in the Society of Friends played in her life. Concurrently, readers get a shocking sense of the thuggishness of the colonial revolutionaries, who exiled her husband for his refusal to enlist and support the war and who perpetrated all manner of cruelties on Drinker, her family, her neighbors, and her fellow Quakers. The conduct of the British occupiers was not much better. The City of Brotherly Love—Quaker City—treated members of the Society of Friends as if they were all treasonous, and many lost life, liberty, and property as a result. Those interested in medical history will also find this work a treasure trove, albeit a gruesome one. There are accounts of yellow fever, of the mysterious illnesses that struck down child after child, of blood-letting and experiments with inoculation, and of Drinker’s persistent ill health that, because she was financially secure, gave her access to the “best” health care available, a decidedly dubious benefit. One narrative thread resonates with a particularly visceral force: her record of dental problems. Toothache is a lifelong preoccupation, and each extraction or loss is recorded, as well as accounts of medical remediation. For example, we learn about attempts to “restore” extracted teeth to their original position in hopes that they will re-root themselves! The theme extends to her children—cutting the first tooth somehow symbolizes a child’s survival—and it’s a source of particular grief when one of her sons dies almost immediately after cutting his first tooth. At this level of human experience, along with all the meetings, all the teas with friends, all the gut-wrenchingly terse accounts of illness and death, the diary takes us deeply into a woman’s life and fleshes out a period too often obscured in patriotic and patriarchal myth-making.